Surprisingly, many of the nerves associated with the race left me once I arrived at the hotel and started settling in. This early in the week, the atmosphere is still very much "spring break" instead of "Ironman", but that will likely change by Thursday when more athletes arrive. Despite this, there were still plenty of people running and biking around town with the same expression on their face as I have had, which reads "what the f$#* am I doing? This is my first glimpse of the run course. Not quite as flat as they advertised! One thing I anticipated, but now feel a bit unprepared for, is the heat. It is hotter than usual here, and is likely to get into the 90's on race day. As I write this, I am one of the few people sitting in full exposed sun in a last ditch attempt to acclimate. Arriving yesterday, I had a lot to keep me distracted, which kept my mind calm. I had to unpack, hit the store to stock up on veggies, get a couple workouts in, and just get settled in. Today, however, I have abolutely nothing to do but relax and sit next to the pool. It sounds awesome, doesn't it? Well, it is, but it's been a long time since I had a whole day with only myself doing nothing. I find that before a race, it is really hard to not do anything. I feel like I should be getting a run in, or a bike, or a quick swim. However, this is a rest day, and I have to take it easy. I have seen many athletes running, biking, and swimming, and I have to admit it made me a bit antsy. But I have to follow my training plan, not theirs. Being alone does give me a chance to kind of blend into the background and just people watch, and there is no shortage of that here. Whatever desire to drink and be a part of the party scene I have ever had is gone now, and I'm grateful to see the world from this perspective. 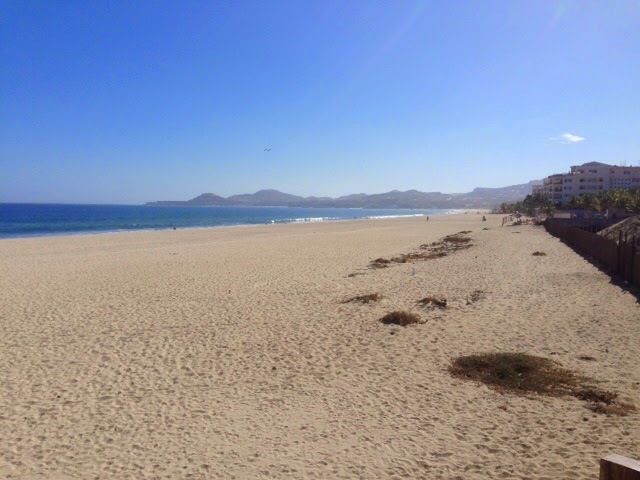 I was up at the rising of the sun, and able to appreciate San Jose del Cabo in its beauty well before many people were coming to. I see many people laying by the pool "recovering" rather than relaxing, or they are just continuing the party from the night before. The locals seem to be really interested in and supportive of the incoming athletic community. They are asking all sorts of questions, wanting to help out in any way, and just being super friendly. When I asked someone about it, they said they're interested because it only happens once a year, and it brings a different, more positive vibe to the area than what is typical. Today is the calm before the storm. Tomorrow, I will begin my day with an ocean swim at Punta Palmilla, take a 90 minute spin, and run for about a half hour. This should give me a good opportunity to swim the course, and get used to running in the heat a bit. As I walked into town today, I have to say that I felt reallly good and confident. 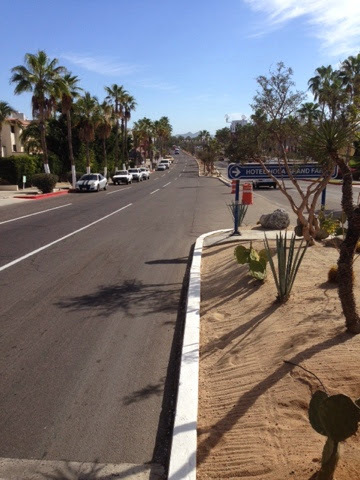 I wasn't overwhelmed by the heat, wasn't huffing and puffing up hills, and was able to keep my heart rate down. Makes me feel like I was able to acclimate pretty successfully. However, I will still have to hydrate properly and keep down my nutrition in order to be successful in this heat. It can be deceiving. Also on the agenda for tomorrow is athlete check in. I will get all my "stuff" for the Ironman, which includes transition bags, special needs bags, swim cap, and wrist bands. The expo also opens, so I can check out all of the fancy gear that is far too expensive. I'll check in again tomorrow after I am able to preview the run and swim a little bit. Unfortunately, I have to wait on the bike, since it won't be here until Friday. Oh well, those hills will still be there come race day. This is how I party in Cabo. 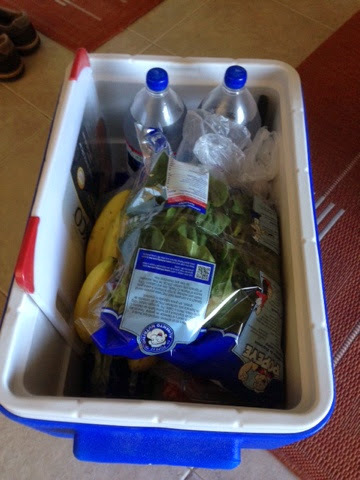 Many spring breakers would probably think it is a waste of a pretty good cooler to fill it with veggies. 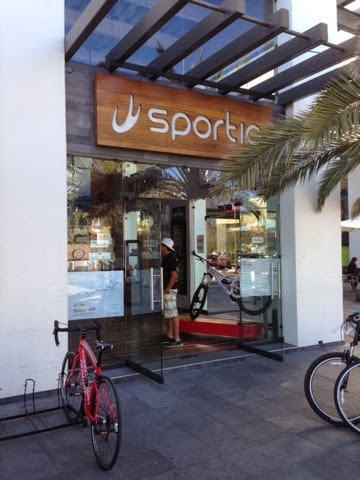 Soon to be the most popular place in San Jose del Cabo. I picked up my CO2 cartridges here (to reinflate flat tires) as the first order of business after checking into the hotel. Airlines won't allow you to fly with CO2 cartridges, so I imagine many athletes will be scrambling to get a few here. 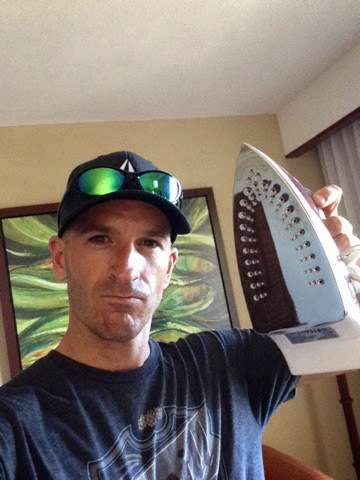 Turns out I was mistaken, these do not come complimentary to all Ironman participants.